Awesome article by the Get Elastic Blog, looking at most elements creating resistance of consumers in the purchasing process on an e-commerce website. German shopping club Brands4Friends.de has raised a €10 million round of funding. It’s their series C, led by Partech International. Some old friends from previous rounds joined them: Mangrove Capital Partners and Holtzbrinck Ventures both chipped in. In these rough economic times, such a large boost in an e-commerce site is quite spectacular. Yet when you read Brands4Friends’ story, the financial backing makes complete sense. We're starting to get alarming messages from the US and Europe regarding online retail's growth in these tough economic times. On the one hand, according to ComScore, 'Online sales growth barely moves the needle in October in the US': the economic slowdown is starting to seriously affect the online retailing industry. The latest: Online retail sales in October grew a scant 1% over sales in October 2007. ComScore says it is the lowest monthly growth since it began tracking e-commerce in 2001 and October was the sixth consecutive month of lower growth than the month before. At least, it's not as bad as offline retail over there: The U.S. Commerce Department reported that retail sales, which include autos, gasoline stations and restaurants, decreased 3.3% in October from October last year. "News from the Old Continent"
On the other hand, e-commerce growth is also slowing down in France, albeit on a smaller scale: according to Fevad, the French e-commerce and distance-selling federation, year-on-year e-commerce growth for Q3 slowed down to 27% instead of 30% in Q1. Read the full analysis here at Journal Du Net (in French, sorry...). 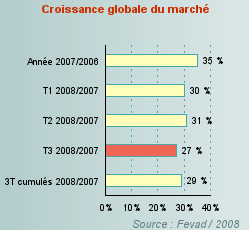 But French analysts still foresee this Christmas to be the biggest for e-commerce ever in France. We're even having our first Cybermonday over here on November 24th (10 years in the making!). Visa have shown off their new card built to combat online shopping fraud. The card, to be tested in Britain next year has a 12 button Keypad and display powered by a battery which should last 3 years. Card holders will be required to key in their pin every time they make a purchase online. A security code is then sent to the card which appears on the display which then needs to be typed into the website. Remember SeenOn? The shop-what-you-see-on-TV online retailer is still here... And their cool "Shopisode" feature is still running. SeenOn enables shoppers to shop the outfits showcased in US TV shows by checking out excerpts of aforementioned shows. The videos are 'chapterized' by product appearance. Another digital grab for Maurice: Google has announced that it will sell its Performics search marketing business (acquired with DoubleClick earlier this year) to Paris-based Publicis Groupe. The deal is expected to close in the third quarter of 2008. Performics will join the ViVaki network. Check out the official Google/Publicis Groupe press release here. Amazon this week unveiled two payment services, Checkout by Amazon and Amazon Simple Pay, which enable other e-retailers to process payments through Amazon. Checkout by Amazon includes some features, such as shipping and tax calculation and order management services, which Amazon Simple Pay does not. Amazon has been testing the payments services since last summer. The biggest draw of these new payment services will be the 81 million consumers already familiar with checking out on Amazon. This is likely to attract small and mid-sized retailers, but bigger players will stay away because they view Amazon as a competitor. Another concern for all retailers considering the service, is that Amazon will use the data it collects about what’s selling to enhance its own product offerings. An Amazon spokesman replies, "We simply plan to use the data to improve the service for our merchant customers." Drugstore.com, will use E4X’s FiftyOne Global Ecommerce Solution to expand sales internationally. Drugstore.com expects to sell in 34 countries before year's end. Visits to online coupon sites increased 56% year-over-year for the week ending June 6, with Coupons.com receiving the largest market share at 29%, according to Hitwise. Coupon Mountain and Eversave accounted for 14% and 16% of visits, respectively, during the same period. Also for the week ending June 6, U.S. visits to comparison shopping sites increased 51% year-over-year, while U.S. visits to discount retailers increased 25% and to traditional department stores increased 15%, Hitwise says. So, it is official - there is no bubble in public Internet stocks... According to ReadWriteWeb. There might be in private valuations, but that is almost impossible to analyze accurately without access to hard data on late stage VC valuations. Turns out the hyperbolic press release with which Apple announced the iPhone 3G’s first sales numbers today may have been more of an understatement than overstatement. Because iPhone 3G’s stunning opening weekend may go down in the books as the largest consumer electronics launch ever. Read full story at AllThingsDigital. My blog is now available on your phone (there's a classic mobile phone version and a cooler iPhone version). 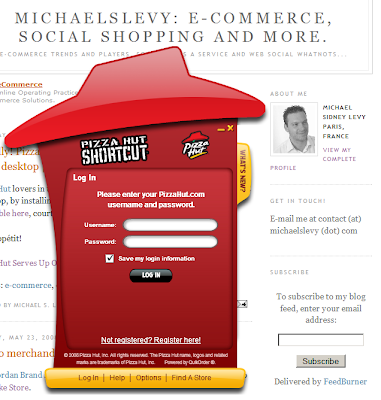 It's here: http://m.michaelslevy.com, bookmark it! Digitas France 2008 Showreel from Michael S. Levy on Vimeo. I'm a proud and starry-eyed daddy since early Thursday morning! She's amazing, she's gorgeous, and I'm in love. You can say 'hello and welcome' to her on her very own Facebook Page! An e-commerce IPO in Europe! YOOX, the online apparel and accessories retailer, is planning an initial public stock offering on the Milan Stock Exchange in the first half of next year. The online apparel and accessories retailer has retained Italian investment banker Eidos Partners as financial advisor to manage the IPO. Established in Italy in 2000 by CEO Federico Marchetti, YOOX Group operates in 53 countries and receives nearly four million visitors a month to its online stores. In 2007 the company delivered more than 1 million items to customers across the world and reported web sales of $121.7 million. LicketyShip company is preparing a relaunch, and will be focusing on aggregating courier services for more than just deliveries of retail goods. In effect, they’ll be taking the huge but highly fragmented courier market and turning it into a web service. Any e-commerce site or retailer, for example, could build in an option for immediate courier delivery. All that would be required is that they have a warehouse near the customer. When your business is online, being temporarily 'closed for business' is NOT good. No official Amazon news release yet. Closing the gap between its e-stores, Gap now allows customer to shop all of its stores online as though it were one site. Customers can switch shops just by clicking tabs, add products to a single cart and check-out in one go. 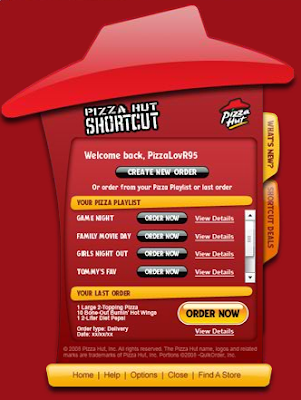 Pizza Hut customers in the US can now order their pizza online and via their PC desktop, by installing an Adobe AIR app, called the Pizza Hut Shortcut, available here, courtesy of the pizza chain website. The Jordan Brand shows off its collection via a video lookbook, driving to the Nike Store. 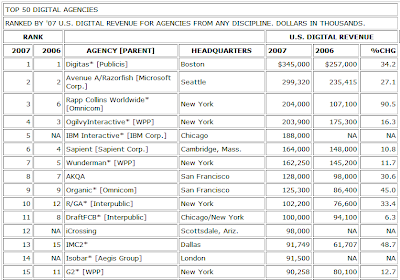 According to Advertising Age, Digitas is the #1 digital agency for 2007 in revenue, in front of Avenue A/Razorfish and Rapp Collins. Reebok is launching a global e-commerce site that will better promote its brand, allow users to send product details to their mobile phones and convey the feeling of shopping in a store, the company says. The footwear and apparel retailer began a soft launch of the updated site for its customers in the UK and France and will roll the site out to several other undisclosed countries throughout 2008. The new site will mark Reebok’s entry into e-commerce in some of the countries. The site automatically redirects to the browser language country, and is in full-Flash & Flex. Although loading times are a little slow, the user interface is nice. Here's a video reel of a few 2007 projects from Digitas US. You can also check out Digitas France's portfolio at www.digitas.fr. Digitas US 2007 Highlight Reel from Michael S. Levy on Vimeo. Rap artist Chamillionaire talks with Pete Cashmore from Mashable about music and the Web, ringtones and what's wrong with the industry's current metrics. Smart and insightful comments with a ghetto entrepreneur twist. E-commerce platform provider - and e/merchant blueprint model - GSI Commerce Inc. has reported a 34% increase in first quarter revenue and reiterated its earlier projection of $1 billion in revenue in 2008, which would be a 33% increase from $750 million in 2007. Also noteworthy, organic growth of e-commerce sales of the about 85 online retailers on the GSI platform is running at about 20%. Update: This feature is provided by Factory 515. US Online fashion store Bluefly.com has soft-launched a cool new feature called 'Shop the Shoot' for its 'b*fly' section. Customers receive an e-mail inviting them to discover the shoot of the b*fly collection at Bluefly studios, which links to an embedded video player within Bluefly's blog, 'Flypaper'. The video is pretty straightforward, with an interview of Ford model Heather and 'making-of' takes of the photo shoot, but there's a 'CLICK TO BUY' link on the player, which displays an interactive overlay, listing the on-screen items and links to jump to the product pages. A true Youtube-like Flash player for e-commerce video. Pretty neat and enticing. I like it. Here's the e-mail creative and a couple of screenshots of the video player, but you can also check it out for yourself. Here's a demo video from Evolution Robotics' ViPR technology: snap a pic of any product off a store shelf with your mobile phone (ANY mobile phone), send it to the ViPR server via e-mail or through the ViPR app, and you get detailed info about the product including copy, specs, video from YouTube and even music from iTunes. "35% say they’re most likely to return to an e-commerce site if it offers customer product recommendations. 26% desire a unique experience each visit, which the continually changing content of Web 2.0 features facilitates, the firms say. And 6% say they’re most likely to return if a site makes them feel part of a community with other shoppers." While the business model for advertising agencies needs change, Publicis CEO Maurice Levy says that agencies will adapt and not become obsolete. Levy says that agencies are the ones who develop the creative, something that companies like Google, Microsoft and Yahoo do not provide. "Agencies do need to gain a better understanding of new media in order to develop better creatives for channels such as video games and cell phones", according to Levy. Publicis may be well on its way to doing just that, having acquired digital agency Digitas for $1.3 billion last year. Apple’s online iTunes Store has surpassed Wal-Mart Stores as the leading U.S. music retailer based on January and February sales, research firm NPD Group says. I beg to differ: iTunes is the leading music retailer in the whole wide world. Among retailers online AND offline. “We launched iTunes less than five years ago, and it has now become the number one music retailer in the world,” says Eddy Cue, vice president of iTunes. To date, iTunes has sold more than 4 billion songs to more than 50 million customers. Ouch for Walmart, for music store chains accross the world... and for all the major music distributors who are scrambling to get on the online music bandwagon a little late. Apparel and accessories led all product categories in number of online purchases in the USA in February, Nielsen Online reports. Apparel and accessories led all product categories in number of online purchases in February, with 9.87 million, or 16% of all online purchases, Nielsen Online reports in its MegaView Online Retail report. It adds that eBay led all retail web sites in number of online purchases in the apparel and accessories category, with 4.6 million, 47% of the market , followed by Victoria’s Secret, with 870,000 purchases and a 9% of the market. Forrester Research concurs: in its State of Retailing Online 2008 report, the apparel category, which surpassed computer gear for the first time in 2006 as the top online sales category, is projected to hold onto the top spot again in 2008, accounting for $26.6 billion in sales, up 17.2% from $22.7 billion last year. Despite the US economic slowdown, e-commerce sales will grow nearly 17% from $175 billion in 2007 to $204 billion this year, according the first installment of the three-part State of Retailing Online 2008 report from research and consulting firm Forrester Research and Shop.org, the online retail arm of the National Retail Federation, a merchant trade association. E-commerce sales also grew 17% from 2006 to 2007, the report says. Online sales will account for 7% of U.S. retail sales this year, up from 6% last year, the report says. “Even in 2008, when retailers in general are expected to encounter challenges with growth due to uncertain or adverse economic circumstances, we project that online retail will continue to erode market share from other channels,” the report says. Forrester has reported separately that, although 61% of U.S. online shoppers expect the economy to worsen in the next year, 85% say they will spend the same or more online in the next year. Half of online retail sales in 2007 came from five categories: apparel, accessories and footwear; computer hardware and software; autos and auto parts; consumer electronics; and home furnishings. The apparel category, which surpassed computer gear for the first time in 2006 as the top online sales category, is projected to hold onto the top spot again in 2008, accounting for $26.6 billion in sales, up 17.2% from $22.7 billion last year. 53% of marketing budgets will be devoted to online customer acquisition and 21% to online tactics for retaining customers, according to the survey of 125 retailers. Search engine marketing is the leading acquisition method, accounting for 35% of new online customers, followed by organic traffic 18%, affiliate programs 7%, e-mail to prospecting lists 7%, and comparison shopping sites 5%. - The retailers surveyed manage an average of 31,839 paid search terms, on average pay 50 cents per click for a search ad and realize $8.47 in revenue per click. - Cost per order for online banners averages $84.21, compared with $50.74 for deals with traditional web portals, $50.11 for social network ads, $32.12 for e-mails to prospecting lists, $27.45 for comparison shopping engines, $19.33 for paid search, $12.24 for affiliate programs, $8.63 for natural search and $6.85 for e-mails to house lists. The average order value is highest for social network ads at $168.80, followed by online banners $133.01, affiliate programs $122.51 and e-mails to house lists $120.27. - While 85% of retailers say they offered free shipping on certain orders, last year, only 33% plan to increase such promotions this year. 57% plan to increase use of offers in outgoing packages from web orders, 45% online-only sales and 40% gift with purchase. Now that broadband access has become the norm in major e-commerce markets and CDN/bandwith pricing has come down (thank you Amazon services), clothing online retailers enrich their product pages with video merchandising. Saks has just launched its 'Fashion in action' video catalog, where 17 selected looks from this Spring's collection are spotlighted. Videos are short-length, with a classic TV-style narration and background music. Kudos for the jewelry cross-selling by the narrator while describing a dress. They've been doing it for quite a while, with their 'Catwalk' video feature, directly accessible from the product page (under the product picture area). Great stuff: extra-short length video of a model wearing the item and walking back and forth on a runway, with a current radio hit song playing in the background. Next up I hope: an interactive video, where users can click each piece worn by the model in order to directcly access the product page? PPR's fashion pure play has just launched its 'Fashion Week' online runway video feature. Select a theme/style and check out men and women models sporting this season's latest fashion. Very nicely done and enticing. You probably didn’t notice, but Amazon just made it easier to quickly glance at the product you want and get all the information you need in order to buy. Really great stuff. Powerpoint of presentation given by CEO Tony Hsieh at the 2008 SXSW Interactive conference. One of the great flameouts of the 1990s tech boom was Kozmo, which started in Manhattan, and let you order a pint of Ben & Jerry’s online and a Kozmo bike messenger would deliver it to your door. After burning through $280 million in capital, they closed shop. Well, now New Yorkers have Wakozi. It just launched and only covers Manhattan wine shops, liquor stores, and delis. But they’ve learned from the failure of Kozmo. They don’t actually deliver anything themselves. Instead, they only list inventories of shops that make their own deliveries. "Amazon Prime is all-you-can-eat express shipping," Bezos says. "Though expensive for the company in the short term, it's a significant benefit and more convenient for the customer." Well, it turns out Bezos was right. The Amazon Prime strategy has helped to accelerate user growth, purchase frequency and unit growth at the company in the past year, while the e-commerce market has "deteriorated". Meaning: free delivery/unlimited delivery for an annual fee generated more costumers, induced cross-category shopping, increased average basket value and purchase frequency! On March 4, Google introduced a new feature that lets users stay on Google to find pages inside major sites. The search box appears when someone enters the name of certain Web addresses or company names rather than searching for specific terms (see screenshot above, courtesy of Techcrunch). First, ads for competitors can be displayed on the Google results page of a site search. This could mean lost traffic and sales for the searched retailer! Second, performing a site search on Google does not take into account merchandising rules retailers create for their own in-site search tool. Great stuff from venture firm Sequoia: key drivers of success for any startup looking for venture capital to drive growth. Summarize the company's business on the back of a business card. Address existing markets poised for rapid growth or change. A market on the path to a $1B potential allows for error and time for real margins to develop. Target customers who will move fast and pay a premium for a unique offering. Customers will only buy a simple product with a singular value proposition. Pick the one thing that is of burning importance to the customer then delight them with a compelling solution. Constantly challenge conventional wisdom. Take the contrarian route. Create novel solutions. Outwit the competition. A company’s DNA is set in the first 90 days. All team members are the smartest or most clever in their domain. "A" level founders attract an "A" level team. Stealth and speed will usually help beat-out large companies. Focus spending on what's critical. Spend only on the priorities and maximize profitability. Start with only a little money. It forces discipline and focus. A huge market with customers yearning for a product developed by great engineers requires very little firepower. Which means they might be more inclined to shop online using their iPhone? Amazon launches two applications for Facebook... Finally! - Amazon Giver allows users to view friends’ wish lists and link directly to Amazon to purchase gifts. - Amazon Grapevine displays a Facebook member’s friends’ recent Amazon.com activity (reviews, wish list adds, tags, purchases). Both applications share information only with friends that the Facebook user selects when adding the application., but not with ALL the user’s friends, in the face of widespread criticism that Facebook's Beacon system violated users’ privacy. SecretPrices.com, a 'shopping mashup combining price comparison, bargains and coupons', from NextGen Shopping LLC in the US, launched yet another social shopping app for Facebook, called MyShopping. Add the app to your profile, and you can start searching, rating, sharing/recommending and purchasing products within Facebook. Product data comes from the SecretPrices database, and products can be purchased from merchants participating in the SecretPrices program. A revenue sharing program for the app users is coming soon, according to the company's blog. Want to shop online while on a train, plane or boat? New British train campany Grand Central Railway Company has installed it on its three brand new lines. BSocial Networks Inc. has launched 'Market Lodge', a system designed for Facebook that enables the social network's users to create miniature e-commerce stores on their Facebook pages. It's yet another approach to Social Commerce. Facebook users can set-up a personalized marketplace, picking products from about 50 retailers so far, and share revenues with BSocial (www.bsocialnetworks.com). Also see Zlio, www.zlio.com, one of the Social Shopping pioneers, where you can set up an affiliate online store replete with products and content in minutes. Here's a link to the video archive of a round-table about Social Shopping, from the 4th E-commerce convention in Paris last September. Among the participants: Zlio, Blog Shopping, Prestigium, Loomeo and OhMyBuzz. The prototypical computer whiz of popular imagination — pasty, geeky, male — has failed to live up to his reputation. Chuck Longanecker is the founder of the Web2.0 consulting firm, digital-telepathy, based in San Diego, Calif. Chuck wrote previously for Found|READ about how to optimize your “startup life” in Run Your Company From The Heart. This piece, on how to recast your startup’s culture, is the second in a series. Kid Sister ft. Kanye West - in HD! Kid Sister ft. Kanye West - "Pro Nails" from Ruben Fleischer on Vimeo. eBay launched their own Flash widget embed offering, eBay modules. Hereunder, I pasted the code for an auction for a night at the Everland hotel in Paris. Cool features, and great way to promote one's auctions on blogs, social networks & co.
Two years ago, Cyber Monday was a marketing gimmick in search of shoppers. This year, it seems to be a genuine trend that retailers have embraced. Neil Kugelman, CEO of US online jeweler Goldspeed.com, is convinced there is no better way to run his business than outsourcing his e-commerce platform. Even though behavior targeting has been around almost as long as the Internet, it had a resurgence of popularity last year. Many in the ecommerce world became enamored with the idea of being able to offer product recommendations based on immediate behavior.